With monthly utility bills being a nagging cost all year long for homeowners, home buyers are more aware than ever about energy-efficient features within prospective homes. 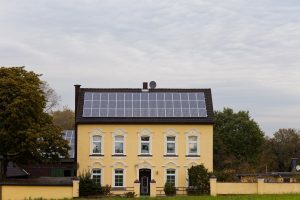 If a home buyer is looking at your house and comparing it to others, having the edge on energy efficiency can be the difference that makes your home the better option. The National Association of Home Builders released a survey stating that 72% of homeowners would be influenced in their home purchasing by energy-efficient features and that 92% want to see an Energy-Star rating for the whole home. Before you start the selling process, consider exploring cost-effective energy updates which will attract more buyers. If you plan on moving within the next 3 years, follow some of our suggestions to make sure that you get the best bang for your buck. To find out where to begin making energy efficiency improvements, schedule a free home energy audit, also known as an energy assessment. An energy specialist will spend around three hours in your home and will provide you a customized list of energy-saving recommendations. This may include upgrading your insulation, replacement windows, along with tasks as simple as using programmable thermostats or changing your light bulbs and faucets. Go to MassSave.com for more information. This is a simple way to gain that competitive edge over other homes that are also on the market once you do list. If you are installing new appliances no matter what, look for ones that are energy efficient. Buyers love the idea of getting a home with new appliances that are energy efficient so they know they’ll be saving more money in the future. When listing your house on MLS, there are various energy efficiency options that when checked off attract more home buyers. If people are looking for specific energy-efficient items, you want them to know your house has what they want. When working with your real estate agent, be sure that you have a discussion about the energy efficient items with them. The more they know, the more of a selling tool it can be. Create a full list of all “green assets” that your home offers. Be as specific as possible. Also, try to include how much money you are saving. If you recently made some changes to knock down the energy bills, provide them with how much you spent before each month and now after. If your recent bills reflect the decrease, share these with your agent as well so they can show the energy costs of the home.